My personal multimedia defense of Our Lady began in earnest that Thursday, as the token conservative in the so-called balanced Notre Dame debate held on CNN.com. I'm not positive what those initials stand for, but after appearing on its "Blogger Bunch" segment, I'm pretty sure they stand for the "Christ Negation Network" or something to that effect. Honestly, I suppose some of the uneveness of the event was my own doing, for after being told I needed to have a Webcam to participate on the show, me and my wife, Jeanette, scrambled around town at nine o'clock that morning trying to find one compatible to our home computer, only to find out after hooking it up that our machine would explode into the blue "warning!" screen whenever my face appeared on camera. Deducing even my dubious mug was not ugly enough to cause such a violent technological reaction, the "doubting Thomas" in me figured this was an ominous omen of the dire things to come. "Obama's going to drop all pretenses Sunday, arrest all the Notre Dame protestors, and declare himself 'King of the World!'" I thought as both our labrador and the CNN cameraman barked out instructions in an attempt to make my face reappear, all to no avail. Finally it was showtime, and the lone voice of reason that day would have to be just a voice. Asked why, when the majority of Catholics supported Obama, that I believed the president should not speak at Notre Dame, I replied that 'There is a recent bishops' statement that [forbids] Catholic universities from awarding honors or allowing a platform to speak to politicians who oppose the Catholic Church's views on human rights, which of course includes abortion. Fr. Jenkins directly disobeyed this [statement] and since Catholicism is a religion where obedience is required, this [disobedience] is a serious thing." Due to my less than ideal preparation for this event, I did not have the bishops' statement that I eluded to ("Catholics in Political Life") in front of me, so I could not quote from it directly. Still, given the format, one wonders if this really made a difference. For while I may not have been my most articulate, my lapsed Catholic opponent, a liberal blogger named Gina Cooper, did not exactly come off as highly literate by referring to the Web site NotreDameScandal.com as "BigFatFakeScandal.com." She then tried to justify her disobedience and cover up the truth by citing soggy statistics of all the Catholic "Cheasters" and other cheaters who supported Obama, ending her rather lengthy propagandizing by proclaiming Obama as the fulfillment of Matthew 25, one who will "feed the hungry, clothe the naked, welcome the stranger, and administer to the sick." Then, after talking to another pro-Obama blogger, a black woman, Lola Adesioye, who knew nothing about Catholicism or Notre Dame, the smug and smirking Christ negating hosts piled on another half dozen or so anti-Catholic viewer comments (along with the words of one pro-life mother who they more or less mocked) before they returned to the man who was blacked out in more ways than one. After reminding Gina that in Matthew 25 Jesus also states "whatsoever you do to the least of my brothers, that you do unto me," I warned the panel that since unborn babies "are obviously the least of his brothers, murdering them is not a good sign for our society." Then, turning to the host's slanted question about Notre Dame inviting the "death penalty" presidents, I agreed that while in almost every circumstance, the death penalty is condemned by the Church, there is almost "a complete difference between killing an innocent baby and someone who has committed a heinous crime." It was here that Gina's response somewhat surprised me, for there was actually some cleverness mixed in with her deviousness. Rather than denying abortion was murder, Gina answered angelically, "In my heart ... I do believe that a baby is a perfectly innocent life, but ... this is not really consistent with Catholic teaching, which says [because of] original sin we are not born innocent and we have to get babtized immediately." As you probably have guessed, CNN did not give me a chance to counter this henious half-truth, merely letting go several more democratic digs designed to make me look like a moron before signing off on the subject. 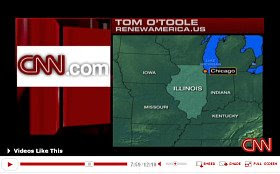 Thus, unable to put me down merely with its usual bias, CNN had to kill Fighting Irish Thomas' message by concluding the segment with a lie. It is interesting to note that, while in her opening statement Ms. Cooper seems to consider herself a good Catholic despite ignoring several Catholic doctrines, she ends her segment by suggesting she must not really be a Catholic because she disagrees with Catholic dogma. In reality, while the dogma of original sin is somewhat complex, and the Catechism of the Catholic Church does teach that "the transmission of original sin is a mystery that we cannot fully understand" (CCC 404), Cooper severely (if not deliberately) twists the part of the teaching that is known to justify her position. For example, while the Church does say that baptism "erases original sin and turns man back to God" (CCC405), it also states that it "is called 'sin' only in an analogical sense; it is not a sin committed ... and does not have the character of a personal fault." And while Cooper is correct in implying that the Church urges infants to be soon baptized, since it "does not know of any means other than baptism that assures entry into eternal beatitude" (CCC 1257), the Church not only "allows hope of salvation for children that died without baptism" (CCC1261) but "has always held the firm conviction that those who suffered death for the sake of the faith" (CCC1258) without baptism—a category many now conclude includes those who have died through abortion—will go to heaven. But if Ms. Cooper is truly worried about the aborted's eternal fate, as the doctrine does seem to still leave at least a little room for doubt, would this not be all the more reason to allow the children to be born—and baptized? In the end, the mock debate held on CNN that Thursday was merely a foreshadowing of the pseudo-dialogue the demigods staged at Notre Dame last Sunday. But what then to make of the baby, whose voice now forever challenges Obama's?